Check your space heater over thoroughly before plugging it in and turning it on. Space heaters are responsible for 43 percent of home heating fires, according to the National Fire Protection Association. Space heaters can be an alternative source of heat for those who want to warm one small area but be wary of their fire risk and lack of energy efficiency. Space heaters are responsible for 43 percent of home heating fires, according to the National Fire Protection Association. In addition, they may not be as energy efficient as some advertisements say. Here are the basics that you need to know before plugging in a space heater. There are two main types of electric space heaters: radiant and convection. Radiant electric space heaters heat objects and people within their line of sight. Cove heaters fall into this category. Some of these heaters are built into wood cabinets to give the look of furniture and include a fan to move and heat the air. Convection electric space heaters circulate air in a room with a fan. Air is blown over a heating element before entering the room. Make sure the heater carries the Underwriter’s Laboratory (UL) label. Only purchase newer model heaters that have all the current safety features, like a tip-over safety switch. This switch automatically shuts off the heater if the unit is tipped over. Inspect and clean the air intake baffles and the fan blades for dust buildup. Consider purchasing a space heater that is cool to the touch and has guards over the coils. Also, look for models that automatically shut off when tipped over or overheating. Space heaters should be kept at least three feet from anything flammable, such as blankets, clothing and paper. Place space heaters out of high-traffic areas and on a level, hard, non-flammable floor surface—NOT on loose pile carpets, furniture or countertops. Plug space heaters directly into the wall outlet. The use of an extension cord or power strip is not recommended. Space heaters and bathrooms are not a good combination, unless the heater is designed for bathroom use. Moisture can damage the heater. Remember that water and electricity don’t mix. Always remember to turn off space heaters when not in use or you’re going to sleep. $54 – The cost of operating two space heaters in one month. Space heater power rating of 1,500 watts or 1.5 kilowatts (kW). 1 hour of use = 1.5 kilowatt hours (kWh). 1.5 kWh x 10 cents per kWh = 15 cents/hour. 6 hours daily use = 90 cents per day. 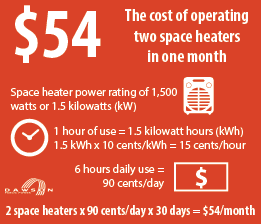 2 space heaters x 90 cents per day x 30 days = $54 per month. Be wary of advertisers claiming that their space heater is more “efficient” and that it will save 50 percent on your energy costs. No matter what the size or shape, a typical space heater has a power rating of 1,500 watts – and they all convert electrical energy into heat. If more space heaters were used or if just two space heaters were running all day, it would use just as much energy as a standard whole house furnace. Space heaters are useful in small areas, such as a study or living room. However, if you need to keep large areas warm, your home heating system will do the job more efficiently. Do not attempt to warm your entire home using only space heaters, as this is inefficient and expensive. Seal air leaks in your home to help reduce the cold air from entering. Space heaters can be an economical choice – but only if you’re heating a small area for a limited time. Otherwise, using the central heating system is more efficient. Focus on sealing air leaks and insulating your home to save energy and money. Follow all space heater safety rules to avoid a fire.